This year marks the 200th anniversary of the birth of Elizabeth Van Lew, the wealthy Richmond heiress who led one of the most successful Union spy rings of the Civil War. Her legacy has been interpreted through the works of journalists, historians and playwrights. 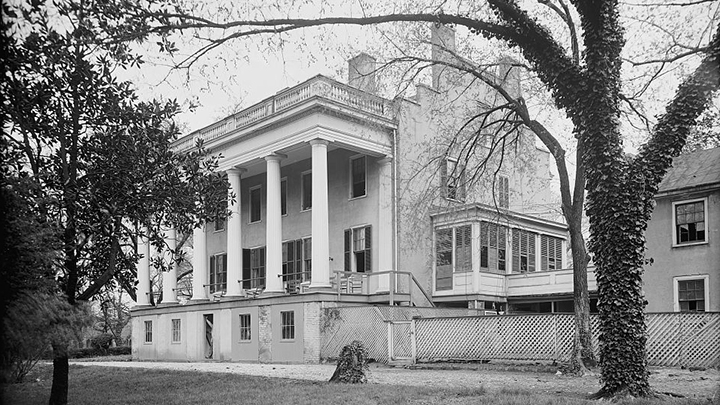 Adding to the intrigue, is Mary Bowser, a woman enslaved by the Van Lew family, rumored to have carried out espionage in the Confederate White House. But as WCVE’s Peter Solomon reports for Virginia Currents, the truth of this story is elusive. Learn More: As part of the April 7, 2018 Emancipation Day at Chimborazo Park, Quill Theatre will stage a reading from a new drama about Elizabeth Van Lew and Mary Bowser titled “Under the Veil.” Watch Dr. Elizabeth Varon and Dr. Lois Leveen discuss Mary Bowser's story in a program called “A Spy in the Confederate White House.” Find information on Dr. Varon's book on Elizabeth Van Lew and Dr. Lois Leveen's novel, The Secrets of Mary Bowser. Find other resources compiled by Mike Gorman including articles and photos pertaining to Richmond in the Civil War. Around the corner from historic St. John's Church, once stood one of the finest mansions in Richmond. The three-storied building was originally the home of the city’s Mayor. It was adorned with stately columns. On the South side, a Greek-Revival portico opened on to a richly cultivated garden and a stunning view of the James River. Tour guide Joseph Bromfield explains the history to a group of middle school students. The structure is no longer here. The site is now occupied by Bellevue Elementary School, but Bromfield fills in the details of the woman who lived here, the wealthy heiress and staunch Unionist named Elizabeth Van Lew. When the Civil War broke out, he says, Van Lew made baked goods and brought them down the hill to Libby Prison. Bromfield: And inside those baked goods are messages. She’s starting to communicate with Union officers who are held prison inside Libbie Prison. She’s giving them books and they’re communicating back and forth. Van Lew's covert activities expanded during the course of the Civil War. She exhausted her inheritance bribing Confederate officials and aiding the escape of imprisoned Union soldiers. She headed a vast interracial spy network, providing crucial intelligence to the Union. And she did all of this right under the noses of Confederate authorities. Bromfield: President Ulysses S Grant makes a statement that Elizabeth Van Lew was the most reliable consistent source of information for the Union army inside the city limits of Richmond. Everything mentioned so far about Elizabeth Van Lew is well documented. But it’s harder to confirm a story that surfaced after Van Lew passed away in 1900. Mary Bowser, who had been enslaved by the Van Lew family, was sent North to get an education. Still a teen, she then traveled with missionaries to Liberia. Bowser returned to live in Richmond during the war. Historians disagree on what happens next. Some believe she worked as a domestic servant in the Confederate White House and spied on Jefferson Davis. Dr. Elizabeth Varon: So this is a fascinating story., a key part of Van Lew's lore as it has come down over the years. Dr. Elizabeth Varon is a Professor of American History at UVA and author of Southern Lady, Yankee Spy, a historical account of Elizabeth Van Lew. Twenty years ago, as she was researching her book, she was frustrated in her efforts to confirm the story about Mary Bowser. Varon: As I started writing this book, I looked as historians do for a paper trail that would establish the sort of in the moment sources but I couldn’t find any civil war era references to this corroboration of this story and then in a sort of a happy accident I happened upon a reference to a Mary Jane Richards. Mary Jane Richards’ story parallels Mary Bowser. Dr. Varon found a record at St. John’s Church dated April 16th, 1861 showing that a “colored woman named Mary” married Wilson Bowser, who was a servant in the Van Lew house. The next day, Virginia seceded from the Union. Varon: And I had some evidence that she was in the Richmond Underground. I found such evidence as I was writing the book. What I didn’t find was any evidence that put her in the Confederate White House the way that the story had suggested. Dr. Varon’s book came out in 2003. Nine years later, the story resurfaced with the publication of an historical novel called The Secrets of Mary Bowser. The book explores Bowser’s relationships to Van Lew, The Confederate First Lady Varina Davis and other historical figures that would have factored prominently during her time in Richmond. It’s a work of fiction, but author and historian Dr. Lois Leveen says it’s deeply informed by history. Dr. Lois Leveen: It would have been wonderful to write a book length biography about Mary but really we just don’t have enough content to do that. So in order to tell her story I had to use as much imagination as research. That said, I only wrote things that could be grounded as deeply as possible in history and in culture and understanding what the experience would have been like. Since the publication of The Secrets of Mary Bowser, new pieces of evidence have emerged. One, says Leveen, is an article describing a lecture given by “Richmonia Richards” in New York. The woman, who’s believed to be Bowser, describes an incident where she went to the home of Jefferson Davis ostensibly to do laundry. A clerk led her to his private office. There, she opened drawers and looked at his papers. Supposedly, Davis walked in but let her go. Mike Gorman: The main problem is the source itself. We don’t start hearing about a named person until well after the war when Van Lew died. Historian Mike Gorman who works at Richmond National Battlefield Park expresses skepticism about the story of Mary Bowser. He doesn’t put the same weight on to speeches, like the one Mary Bowser purportedly gave in New York and he wonders why the story went cold after the 1860s. While he believes Bowser existed and has seen evidence of her work in the Freedmen’s Bureau after the war, he says people romanticized parts of her story. Gorman: This is a deliberate – all these are a deliberate attempt at hero crafting, at creating a narrative, especially with Van Lew. And this was done by people certainly in the North by major publications like Harper's. It becomes a very romantic Victorian story. It just does, and this fits that story. Gorman: Who knows? A lot of people would have benefitted from saying so, You're always stuck with the sources that you got. It's not enough to say for sure for me. Where does this leave things? It's possible that more evidence will surface confirming or dispelling the details of Mary Bowser’s life. Many remain intrigued by her story. Richmond playwrights are creating a dramatic treatment called "Under the Veil" about Mary Bowser and Elizabeth Van Lew. A reading will be staged by Quill Theatre as part of Emancipation Day at Chimborazo Park. And Bowser is part of the Emancipation Proclamation and Freedom Monument which will be unveiled in 2019 on Brown's Island. For Virginia Currents, I'm Peter Solomon, WCVE News.